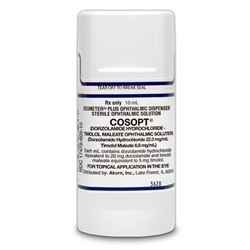 Sterile Cosopt dorzolamide hydrochloride 22.3mg/ml & timolol maleate 6.8mg/ml ophthalmic Solution in 10mL bottle. Manufactured by Akorn. NDC Number: 17478-605-10. Comes as singles.